Stephen loves Caesar salad. It is his all time favorite meal. Caesar salad used to be our traditional anniversary dinner. That was until we went to the Pasta Moon in, our anniversary vacation spot, Half Moon Bay and tried their Risotto Sea Scallops and tomato basil salad with whipped cheese. It is pretty pricey but well worth the experience. Stephen was not feeling well when he returned from a week long business trip. We are not used to eating a lot of prepackaged foods or greasy fast food. I roasted a chicken the night before and decided to make his favorite feel good meal, Caesar salad. I always prefer to make my own salad dressings. I think homemade dressings taste better. Plus you can control what goes into it eliminating some of the fat and the need for preservatives and everything else artificial. 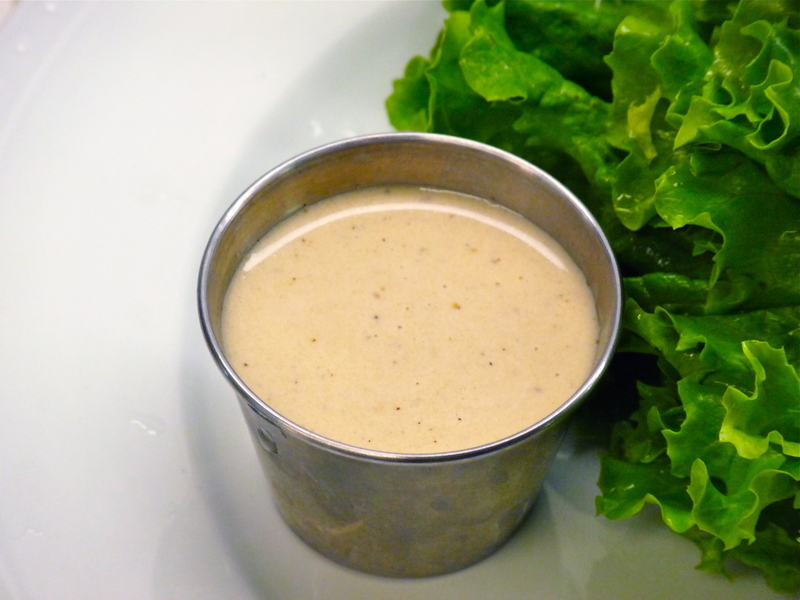 We love the flavor and the texture of this version of Caesar dressing adapted from Cooking Light. I have noted the anchovy paste as optional. We never add it simply because I rarely have it on hand. 1) Whisk all ingredients together in a small bowl. Pour on salad. That’s it. -3 tbsp Mayo in the place of the yogurt.